Landowners sometimes experience bear problems with livestock, crops, orchards, berry patches, and beehives. Corral animals close to buildings at night. Promptly bury dead animals or take them to a rendering plant. Encourage hunting in problem areas. Monitor crops to detect problems early. 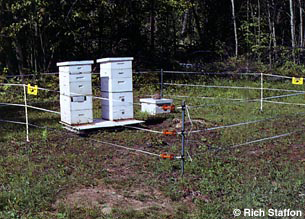 Beehives protected by energized fencing system. Because of potentially large financial losses, bears are especially troublesome in orchards and beehives. Energized fences are the best long-term control measure for these situations. These fencing systems will prevent wildlife damage when installed and maintained properly. If damage occurs, contact your local DNR Area Wildlife Manager or Conservation Officer immediately for technical recommendations.